December 13 is the National Indian Pudding Day. Indian pudding is a kind of hasty pudding typical for New England. This dessert is considered a cold-weather classic. Hasty pudding is a dish of grains cooked in milk or water. It originates in Britain and was first made in the 16th century. British hasty pudding is made from wheat flour. In the 17th century, it was brought to North America by English colonists where it was completely transformed. As colonists had no wheat, they substituted it with cornmeal. The new name Indian pudding was derived from Indian meal, the colonist's name for cornmeal. They called it so because they learned to cultivate this grain from the indigenous peoples. Colonists substituted milk for water, added maple syrup or molasses as sweeteners, and used available spices, typically ginger and cinnamon. Indian pudding might also include eggs, butter, raisins, and nuts. Indian pudding is baked in a slow oven for several hours. It has a smooth texture while traditional hasty pudding is more porridge-like. 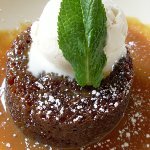 Indian pudding is typically served warm and sometimes accompanied by whipped cream or ice cream. Indian pudding used to be a traditional Thanksgiving dish. It is still associated with fall holidays, no wonder the National Indian Pudding Day is celebrated in November.